Try to grab an opportunity to see Wire on the Box: 1979. It’s a DVD of the pop group Wire performing live on a German TV show. They get through almost 20 songs in almost an hour. It’s a striking document of how the group twisted the pop format, and stripped it off all the unnecessary adornments, and then took the remaining parts and arranged them in a strikingly different way. I would have loved to be an eye witness. The writer Barry Gifford seems to come from a similar school as Wire. He does not believe in writing too much. He seems to specialise in very disciplined spurts of words. Chapters that are like short, sharp jabs. Not one word too many. If Wire’s heads were turned by Eno and the first Ramones record, then Barry Gifford’s writing was shaped by the pulp noir writers’ pared-down prose and the beat poets. If you want to listen to Wire, then the Chairs Missing set is a fantastic place to start. I grew up thinking all pop should be as strange and lovely as this record. And if you want to read Barry Gifford then why not start with his Out Of The Past – Adventures in Film Noir. Originally published as The Devil Thumbs A Ride & Other Unforgettable Films, it’s a collection of thoughts on over a hundred noir (in a very loose sense) films. Each piece is around 500 to 1,000 words, like it’s a strict Japanese poetry form, and quite brilliant. They make you want to go out and get hold of all of these films, giving you just enough to stimulate the desire ducts. Just like, say, Julian Cope in his Krautrocksampler made us want to rush out and immerse ourselves in mysterious old Cluster and La Dusseldorf records. Barry Gifford writes about the significance of performances by Ida Lupino and Gloria Grahame like Julian writes about the guitar playing of Edgar Froese and Michael Rother. The piece on Truffaut’s Shoot The Piano Player is particularly good. Did I first come across this film in the liner notes of Dylan’s Times They Are A Changing? 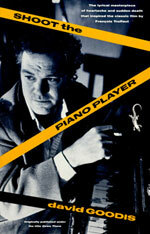 “There’s a movie called Shoot The Piano Player, the last line proclaimin’ ‘music, man, that’s where it’s at’. It is a religious line. Outside, the chimes ring an’ they are still ringing”. Barry Gifford quite rightly starts this piece with some words on David Goodis. I’ve read a lot of words now on David Goodis, but these are some of the best words. Truffaut and Godard reflected the French new wave’s interest in a writer largely ignored elsewhere. Godard typically would throw in allusions to Goodis in Une Femme Est Une Femme and Made In USA. It would be a long time before the works of David Goodis were as carefully examined as the films of Godard and Truffaut. His books seem to be out of circulation for years on end, depriving people the pleasure of being swallowed up in their suffocating fog of hopeless despair and fatalism. It was in fact Barry Gifford who tried to redress this injustice, and salvage several of Goodis’ titles in the 1980s, when he was editor of the Black Lizard imprint. His role at Black Lizard was to rescue many lost works of classic noir literature, by the likes of Jim Thompson, Paul Cain, Charles Willeford, James M Cain, and even Gertrude Stein. And some of these are among the best books ever written, like Pick-Up, Black Friday, Fast One, and The Grifters. The series would also include Gifford’s own Port Tropique. Barry Gifford is one of the great American writers. He is up there with Patricia Highsmith, Richard Brautigan, Raymond Carver, and Jim Dodge. 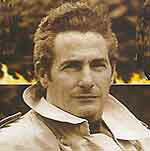 Another of the great American writers Richard Price has argued: “Barry Gifford was, is, and always shall be an American Original. His work evokes so many sensibilities, from the Beats to noir to social realism to postmodernism to cinematic, both stirring up ghosts and invoking the future”. Ironically Gifford as a writer is best known for Wild At Heart, which was turned into a David Lynch film, and incredibly included a fragment of African Headcharge’s 'Far Away Chant' from the still astonishing 1981 Adrian Sherwood-produced set My Life In A Hole In The Ground. I am not a great David Lynch fan, but the book itself is wonderful and forms part of a series of novels following the lives and loves of Sailor Ripley and Lula Fortune. That same series includes Gifford’s Perdita Durango, and its eponymous nagual-eyed Tura Sultana-like figure is one of the wildest literary creations, spectacularly brought to life by the great Rosie Perez on the silver screen. And who, by the way, can forget the start of Do The Right Thing? On through Night People, Arise and Walk, Baby Cat-Face, and The Sinaloa Story, Gifford would create a series of stories that in his own words dealt with “some monsters in American society. Specifically racism, fundamentalist religion, certain kinds of absurd violence. And trying to come to grips with it and understand it and describe it, sometimes in graphic ways but always with a kind of unreal aspect to it”. Like the writings of David Goodis, these books were not particularly pleasant places to be, but the art remains. And anyone that flits between quoting Tuesday Weld and Roland Barthes at the start of his stories is a good man, and when chapters start with transsexual Cuban bartenders offering free drinks to whoever would play Lookin’ for a Love by the Valentinos then you know you’re in the presence of a beauty in itself rare - no matter how mad the company. 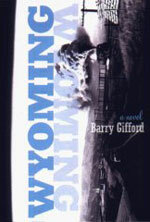 More recent books by Gifford, such as the novella Wyoming and the short story collection Do The Blind Dream, have been more starkly beautiful, and more closely connected to his poetry roots. It’s worth mentioning one of Gifford’s earlier ventures in the ‘70s was to run the Workingman’s Press, putting out small runs of poetry, like Ginsberg’s Sad Dust Glories, which is a beautiful title. And things don’t get more poetic than Gifford’s short story A Day’s Worth of Beauty, where he manages to throw in allusions to the Paris Sisters, Gene Tierney, and classical mythology in just four pages. Gifford does that so well. At the start of The Sinaloa Story, Gifford has Del Ray remembering his Ava wearing the green scarf with purple and yellow parrots on it, like Ava Gardner in The Killers, one of his favourite films, and one of those films he wrote about, as he imagined many of the Cahiers du Cinema reviews of the 1950s were written, on the café or kitchen table, at one in the morning.